The Yankees selling? The Royals in the playoffs? The Rangers and Red Sox making moves? Jay Jaffe gazes into his crystal ball to predict what's ahead for the AL in the second half. The passing of both the season's true midpoint and the All-Star break means that it's time to get serious about the playoff races, particularly as teams sort themselves into contenders and pretenders in advance of the trade deadline (Aug. 1 this year, so as not to interrupt Sunday afternoon games). So in a grand tradition begun in 2012, it's time for me to offer my bold predictions for the second half. Predictions are a necessary evil in this industry. If you're in the business of writing about baseball, you're expected to make 'em and to wear 'em if they don't pan out, because hell hath no fury like a fan base that remembers whom you picked to win back in March and whom you snubbed. No matter how you arrive at them—crunching numbers via NASA supercomputers, holding a candlelight séance with the ghost of Branch Rickey, glancing at last year's picks and doing the complete opposite—history has shown that most of them will be wrong anyway. The exceptions will make you think you've cracked the code to this game for long enough to get a false sense of superiority, but the majority will be star-spangled spectacularly wrong, worthy of burial in an unmarked grave in a distant sandlot when all is said and done. Via my crystal ball, what follows here and in a companion piece for Thursday are a fistful of predictions for the second half for each league—some founded in good old common sense, others from out of leftfield. The only guarantee is that by season's end, somebody will have reminded me that I was wrong, because that's what the internet is for. Whatever Brian Cashman, Joe Girardi and company are doing, it's not working, as the Yankees (44–44) are .500 or worse at the break for just the third time in this millennium but the second time in three seasons. The offense is a measly 11th in the league in scoring (4.22 runs per game) with just three regulars posting an OPS+ above 100. The rotation is 11th in ERA (4.81), with just two pitchers preventing runs at a better-than-average clip, one of whom (Masahiro Tanaka) has pitched poorly when given fewer than five days rest. New York has been outscored by 34 runs for the league's fourth-worst run differential, and the Baseball Prospectus Playoff Odds give the Yankees a mere 2.0% chance at winning the division and a 5.3% chance of reaching the wild-card game; their adjusted odds of winning the World Series are 0.4%, the lowest of any of the 11 AL teams that hasn't already flatlined. Bob Lemon ain’t walking through that door. It's time to strip the roster for parts, and it needs to be done now, before anybody gets even more banged up, particularly given Beltran's injury history. The 39-year-old pending free agent made the AL All-Star squad with a strong first half (.299/.338/.550 with team highs of 19 homers and a 132 OPS+) and can help prop up a contender’s offense down the stretch, particularly an AL one. Meanwhile, Chapman (2.49 ERA, 13.5 strikeouts per nine) will be the most highly-sought closer at the deadline despite the domestic violence black mark against his name. The Cubs have been itching for him and they’ve got young talent to burn, and if the Yankees want to re-create this year’s three-headed bullpen, they can re-sign the game’s fastest pitcher as a free agent this winter. While the Yankees don't need to trade the still-affordable Andrew Miller if they don't get exactly what they want, reasonable offers for Brett Gardner, Chase Headley and anybody else who's over 30 should not be refused. Prayers that Mark Teixeira (.193/.272/.317) puts together a hot few weeks and can slide through August waivers should be encouraged. Rebuild, reset, retool, revamp—whatever euphemism the Yankees have to do to sell this nightmare scenario to themselves and a fan base that’s more patient than the brass will admit, it's time to move on. The Sox (49–38) are two games behind the Orioles (51–36) in the division race, and while both contenders have offense for days, their rotations are in rough shape, ranking ninth and 14th in ERA (4.72 and 5.15), respectively. Of the two teams, however, Boston has a clear edge there and in quality-start rate (51% to 39%) and has three starters preventing runs at a better-than-average clip in Steven Wright, Rick Porcello and David Price, with the last of those pitching much better since mid-May (3.14 ERA in his last 12 starts). The Sox have also got a much deeper farm system to draw from than the O's and Blue Jays (with whom they're currently tied), which means that they can pull in the best starter available at the deadline. Given the Braves' resistance to moving Julio Teheran, all eyes fall to Pomeranz, the Padres' 27-year-old All-Star lefty, who is currently pitching to a 2.47 ERA and 3.18 FIP with 10.1 strikeouts per nine. Oft-injured (he's above 100 innings for the first time in parts of six major league seasons) and oft-traded (he was drafted by the Indians with the fifth pick in 2010 and has since passed through the Rockies and A's as well), he's been one of the few bright spots for San Diego this year. While he has two more years of club control, the team has softened its stance on not dealing him, and his injury history suggests that general manager A.J. Preller shouldn't wait. The Padres and Red Sox hooked up for the Craig Kimbrel deal last year; it says here they'll do it again, with an eye-opening haul (but not super prospect Yoan Moncada) heading west. The Rangers own the league's best record (54–36) despite injuries to Shin-soo Choo, Yu Darvish, Derek Holland, Colby Lewis and others; the withering of the bats of Prince Fielder (66 OPS+) and Mitch Moreland (82 OPS+); and a mere +16 run differential. They have numerous needs, but one area they could really stand to shore up is catcher, where four players have started between 10 and 33 games in the wake of Robinson Chirinos's broken right forearm suffered back in April (he's since returned). The 30-year-old Lucroy has bounced back from an injury-plagued 2015 season, hitting .304/.361/.491 with 11 homers and a 124 OPS+, and the rebuilding Brewers need to sell high lest he get hurt again, particularly now that he's publicly blessed such a move. Making just $4.25 million this year with a no-brainer $5.25 million option for 2017, he'll bring back a significant multi-prospect haul from a system whose deeper recesses the Brewers have been spotted scouting. This makes too much sense not to happen. The 21-year-old Correa hasn't quite lived up to the high standard he set in 2015 en route to AL Rookie of the Year honors: His .260/.354/.459 line represents a 14-point drop in OPS+ relative to last year, from 134 to 118. His performance has been on the rise, however: He has slugged .527 with 18 extra-base hits in 33 games since the start of June, compared to .414 and 16 extra-base hits in 52 games prior, and as FanGraphs' Eno Sarris points out, he's become more selective within the strike zone and is pulling the ball with more authority. Meanwhile, 2015 No. 2 pick Alex Bregman—a 22-year-old shortstop now playing third base and hitting .309/.416/.603 at Double and Triple A stops this year, not to mention a three-hit showing at this past weekend's Futures Game—is expected to be called up before month's end. Already beating him to the Show: 23-year-old first baseman A.J. Reed, considered a Rookie of the Year candidate back in the spring. Expect that young nucleus—which also includes 26-year-olds Jose Altuve (who is having a career year) and George Springer (who is healthy) and 22-year-old Lance McCullers—to help build upon the Astros' 41–24 showing since May 1. In that span, they've been a game and a half better than the Rangers in the standings and 102 points better in terms of Pythagorean winning percentage (.602 to .500). It says here Houston will pass its banged-up intrastate rivals to win the AL West, with Texas claiming a wild-card spot. The defending World Champions are just 45–43 and have just three regulars with an OPS+ of 100 or better (All-Stars Eric Hosmer and Salvador Perez plus Kendrys Morales), only one starter with an ERA+ above 100 (Ian Kennedy), an elite closer (Wade Davis) on the DL, a -26 run differential and an 8.5% chance at the playoffs per BP. In other words, Ned Yost's bunch are perfectly primed to overcome the doubters, haters, naysayers and the teams with deeper rosters to sneak back into October via a wild-card spot (the Indians will continue to ride LeBron James's championship mojo to the AL Central crown). How? Maybe George Brett will come out of retirement to hold down the hot corner in the absence of Mike Moustakas, with Frank White joining him after Cheslor Cuthbert and Whit Merrifield are unmasked as ID thefts from snobby, yacht-owning prep schoolers. Maybe Yordano Ventura will stop headhunting and channel his immense talent into actually getting batters out. Maybe Chris Young will cease giving up homers at an historic rate (3.8 per nine in 61 innings), or light-hitting backup catcher Drew Butera will find his true calling on the mound, emerging as a key setup man while Davis is out. Like everybody else, I didn't pick them to win last year, so I'm just throwing darts here. The Angels (37–52) are an eyesore, on pace to post their lowest full-season winning percentage since 1980 and allow more runs than in any year since 2000, Scioscia's first on the job. 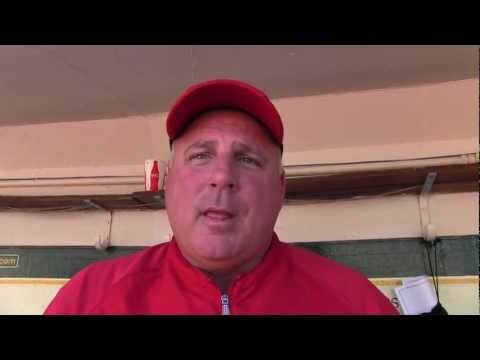 On bad nights, Scioscia surveys this mess to the point that his face becomes redder than his jacket. But since he clearly has no intention of walking away from a contract that runs through 2018 despite this team's bleak outlook, doctors will order the 57-year-old skipper to avoid actually watching his club—except when Los Angeles' 24-year-old prodigy is making his case to become just the third player to win MVP honors while toiling for a last-place team.